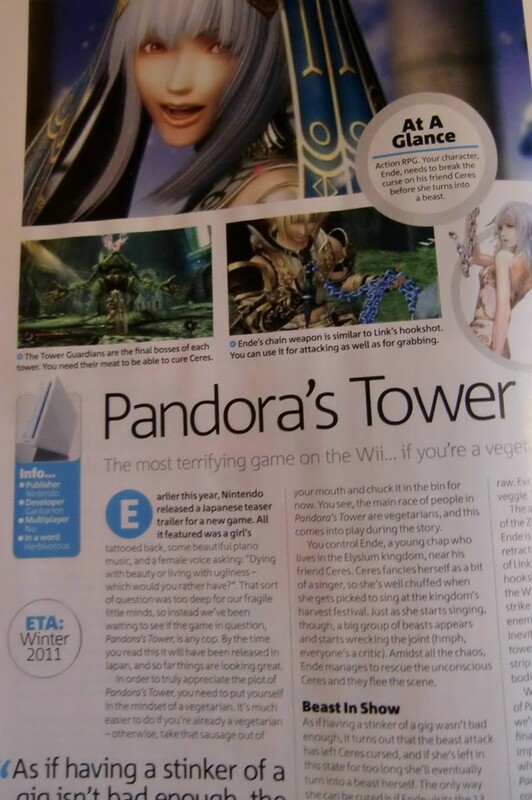 Official Nintendo Magazine Hints at a Western Release of Pandora’s Tower? Pandora’s Tower is a Zelda-esque game that was released in Japan this year on May the 26th and it was a huge success. It sold 21,445 copies on the week of its release (See this article for more details) and scored 36/40 in the Japanese video game magazine Famitsu. So far we have believed that we would never have the pleasure of seeing this game in the west – until now. This months issue of the UK based Official Nintendo Magazine strongly hinted at a Western release of the game Pandora’s Tower. 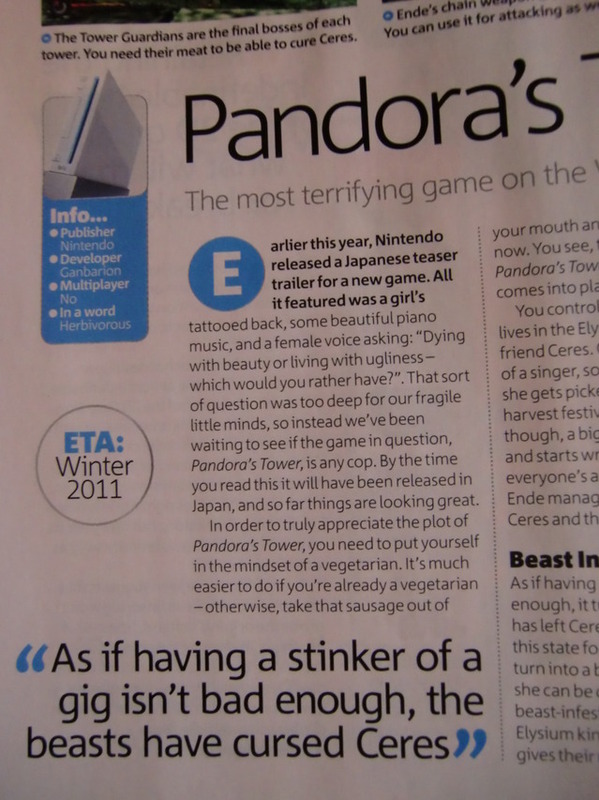 As you can see from the image below Official Nintendo Magazine have put on their preview page of Pandora’s Tower that their Estimated Time of Arrival for Pandora’s Box is Winter 2011 – a huge sign that this Japanese action RPG may be coming to the West, at around the same time Zelda: Skyward Sword will be arriving, no less! If Official Nintendo Magazine are correct, and Pandora’s Tower does come to the Wii in the Winter, in my opinion it looks like this Winter is shaping up to be one of the best for the Wii. Let’s hope we do see it arrive on the Wii this year, it would make a great addition to any Nintendo fan’s Christmas list that’s for sure! How about you, would you like to see Pandora’s Tower on game shop shelves in the West? Do you think that Official Nintendo Magazine is just speculating or do they know something we don’t? Lauren Jepson is a new news poster for ZeldaInformer. She is a student situated in the UK who enjoys tons of video games in her spare time and is looking forward to getting involved in the ZeldaInformer community.